Not just a regular grocery store run but one where she helps put everything in the cart. This is probably one of Harper’s favorite things. For young girls, try pointing items out and naming them. 2. Kick a soccer ball. Share a yummy smoothie. We have a Tropical Smoothie in walking distance so this works out for us. Our girl loves helping her daddy fill up water balloons and enjoys playing with them even more. 7. Play in the Rain. Harper LOVES playing in the rain with her daddy. For a short time, she would insist on daddy and her wearing their rain coats together EVEN WHEN IT WASN’T RAINING! 8. Go to a free kid’s workshop. They offer free workshops at Lowe’s, Home Depot and Pottery Barn. This is one of Peter and Harper’s favorite things to do, since they both really want a puppy! At the pet store near us, they allow you to hold any of the animals. It’s a blast. 10. 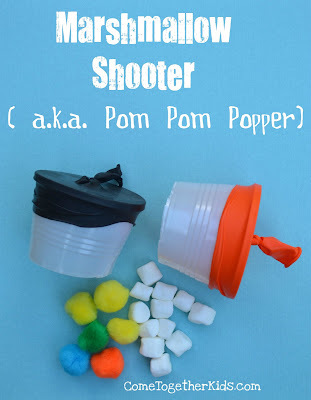 Make and Play with Marshmallow Shooters. 11. Visit a Fire Station. Collect acorns, watch ants or other bugs, who can find the biggest leaf? 13. Make soap boats and race them. Find bars at the Dollar Tree and use pumpkin carving tools or just spoons, butter knives, tooth picks. What little girl doesn’t want to sit on her daddy’s lap and read books! Barnes and Noble usually has a train set or kid area. Find a giant card board box to paint and turn into a fort. Let your little lady choose a special treat. Ask her to help you find something mom might like. Definitely on Peter’s top 5! Turn on your favorite jams and unleash the dance moves! Another favorite in our family. Bath time is where they have some great fun and really get crazy. Harper LOVES the Bible app on our IPAD and asks for it multiple times a day. She loves cuddling with daddy and listening to Bible stories. What are some of your favorite daddy daughter date ideas? This entry was posted in Family and tagged Date Ideas, Toddler. Bookmark the permalink. My daughter will be going on daddy daughter dates soon! She can’t walk yet, but her first one technically is going to be this weekend. I seriously want to cry when I read or see anything about daddy daughter dates because they are so incredibly sweet. What a great father you have for your girl! Great round-up of ideas!! I always try to push daddy/son dates. Mason and I are with each other all the time and I want him and Daddy to have some time, too! Such a great list and so very sweet! This is so adorable! I love that you included reading the bible. That is my sons favorite thing to do right now and it makes me so proud. I’m pinning for sure! Loooove those daddy and daughter dates, great ideas! These are such great and easy ideas! How absolutely precious!!! I can’t wait until we have a daughter! She’ll have my husband just eating out of her hand!